* A36 is incomplete when used as a fastener specification, because it is a raw steel specification. Anchor rods, also referred as anchor bolts, concrete embeds or foundation bolts, are embedded in concrete foundations to support structural steel columns, light poles, traffic signals, highway sign structures, industrial equipment and many other applications. 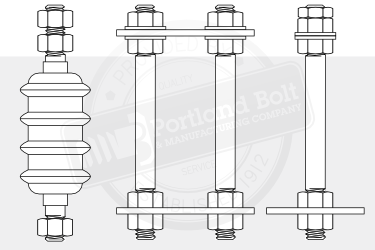 Portland Bolt has the ability to manufacture anchor rods from 1/2″ – 6″ diameter. Anchor rod assemblies are available in a number of ASTM specifications including: F1554 grade 36, 55 & 105, A449, A354 and many others. Anchor plates, pipe sleeves, light fabrication and welding are all performed on site to provide fast delivery at the highest quality. Rods are provided either plain steel or hot-dip galvanized. All manufacturing processes, including hot-dip galvanizing are completed in our facility. Anchor plates, both square or rectangle, are produced on site. Our ability to punch and shear up to 1″ plate allows us to meet your special requirements and provide solutions to reduce the overall material cost. 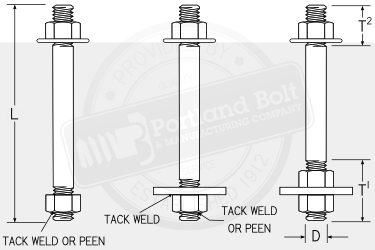 Portland Bolt stocks several anchor rods in varying diameters, lengths, and grades. In most cases, anchor rods are specifically designed for a given project and repetitive sizes are not used frequently enough to justify a stocking program. The anchor rods Portland Bolt inventories happen to be standard products for various Departments of Transportation throughout the country and are used for applications including light poles, traffic signal poles, and overhead sign structures. 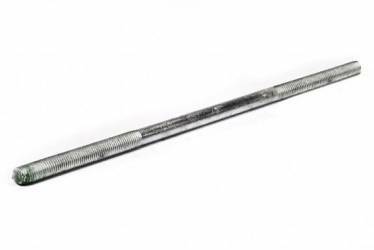 If your project requires an anchor rod with dimensions that are identical or similar to a size we stock, we have them available for immediate shipment. Please note that any variation in size or grade from the anchor rods that have been engineered into your structure should be approved by an engineer prior to ordering.